Sometimes, when I feel discouraged and am trying my best to make important changes in my life, I can lose sight of the startling and critical fact that I am not alone. The Lord is always with me, arms around me, walking my path with me, sustaining and supporting me, carrying me when necessary. The scriptures abound with confirmation of this. When I first became aware of this scripture, I pondered how the Lord could hold my right hand. He must be right next to me! Holy cow! I am standing here, looking at this same incredible mountain that I have to climb, but now He is standing next to me, holding my right hand. He can do anything! If He is holding my right hand, together we can do anything! I began wearing bangle bracelets on my right wrist to remind me always that he is holding my hand. I still wear them. Eventually I came across a slightly different picture described in the scriptures. The Lord could still be holding my right hand, but he is also on my left! I am “encircled about in the arms of His love!” I love that image! But what would that look like in my life, I wondered. A picture came into my mind of me holding a small child. We are sitting at a table. The child has just drawn a picture – mostly just lines on the page: joyous, exuberant scribbles. Now she wants me to help her write her name. I don’t do it for her. 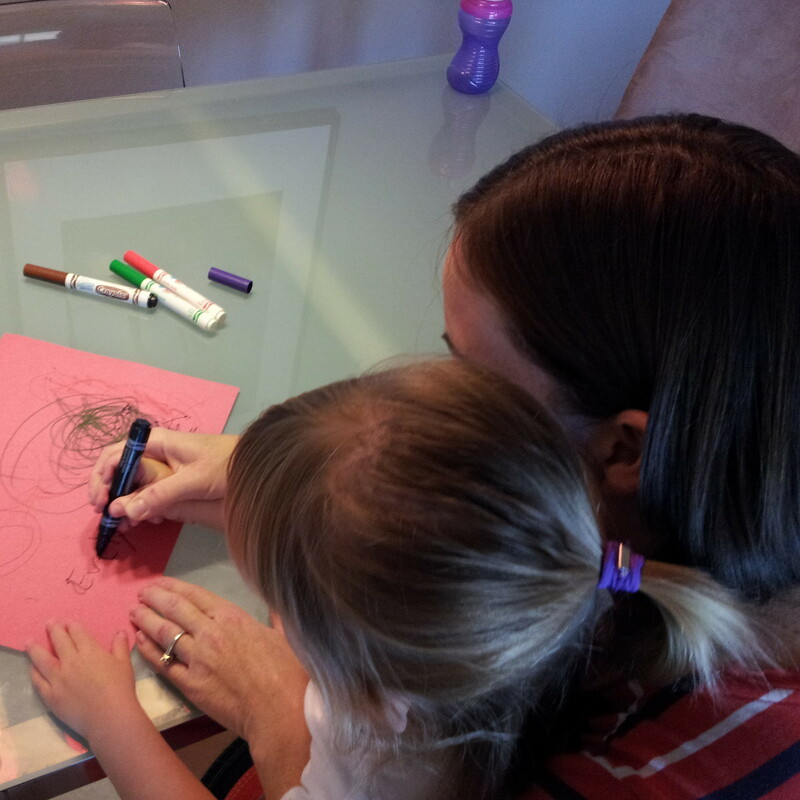 I hold her gently on my lap, my right hand over hers as she holds the crayon. Together we slowly and carefully write her name on her picture. She is so proud! And then, done with my help, she hops off my lap and is on to other things. Perhaps that is how Christ has me encircled in the arms of His love. When I am willing to come to Him for help, he gently cradles me, lovingly reaches around me and guides me to be able to do all things that he would like me to do. There is nothing too small to ask for His help with. Am I having trouble getting to bed early or getting to sleep or getting up early or reading my scriptures or getting to work on time or finding a job or magnifying my calling or dealing with stress or changing my behavior or being kind to my family or giving up my addiction? Those things are all “expedient in [Him].” I pray for the desire and the willingness to walk the Lord’s path for me always; to come to Him for His help whenever I need it; to be grateful for his power, strength, gifts, talents, and abilities; to always remember that I am encircled about in the arms of His love, and that he is right next to me. I am never alone. Can you image the Lord being right next to you, holding your hand? What might you be able to do with His guidance that you are having trouble doing now? Are you willing to turn to Him for His help? Thank you for the visualization of the hand of God. Whether our trials are big or small is not what’s important, it’s that we grow in our relationship and seek the lesson in front of us at that moment. This applies to anyone and they don’t have to be in recovery. I have been learning and do believe with all my heart that the Savior loves us and can do anything. That has helped me to change my thoughts on prayer. I can pray and ask for anything and will receive His help. He knows already what is going to happen and what I need to be doing. I am learning about trust and patience as I work on making sure the spirit is in my home. This metaphor is really a big help. Picturing His arms around me brings great comfort and encouragement. What a good reminder and help. Lovely thoughts, Mira. Thank you.